HALIFAX -- Federal officials are looking into how a Saudi man may have fled Canada while facing sexual assault charges, as legal experts suspect the Middle Eastern kingdom's embassy played a key role. 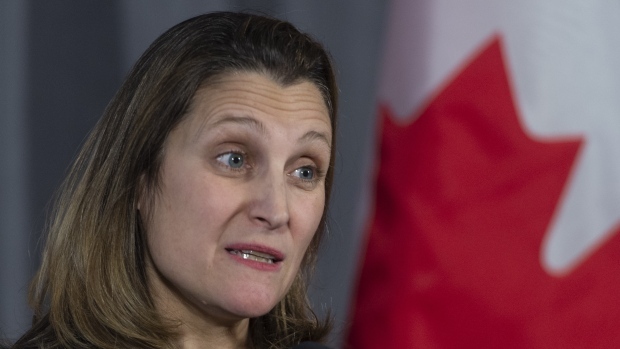 Foreign Affairs Minister Chrystia Freeland told reporters in Sherbrooke, Que., on Thursday evening that it's cause for concern when anyone skips bail while facing serious criminal charges, and said, "in that particular case we are looking into it." Alzoabi's whereabouts remain a mystery, but a court document says a sheriff unsuccessfully tried to locate Alzoabi on Dec. 8, and quotes his lawyer at the time as saying the young man had "fled the country some time ago." Crown prosecutors say Alzoabi had $37,500 of his bail posted by the Saudi Arabian embassy last year in relation to the alleged sexual assault, assault and forcible confinement of a woman between Aug. 1, 2015, and March 26, 2017. Chris Hansen, a spokeswoman for the Crown prosecution office, also says that Alzoabi was facing 36 different fines for various motor vehicle violations. The bail put up by the embassy was forfeited when Alzoabi failed to appear last week in court. Alzoabi had been in Nova Scotia attending Cape Breton University as a student in its business program, and graduated last year. Robert Currie, a professor at the Schulich school of law at Dalhousie University, says the case is similar to an incident just over a decade ago where another Saudi student managed to return to his country as he faced sexual assault charges in Halifax, even though his passport had been seized. He said if Saudi Arabia is assisting students who are facing trial in Canada to escape justice then it is a "flagrant violation of international law," and Ottawa should demand explanations and formally protest. The Saudi embassy has refused to provide any comment to media outlets since the story first became public last week. The Cape Breton Regional Police said Friday they have no further information on Alzoabi's location. Spokeswoman Desiree Vassallo said, "we are working with federal policing partners on the process of having him added to the Interpol list." Interpol is a policing organization that includes 192 countries and is focused on finding missing or wanted people. Currie said it's a basic aspect of international law that nations don't attempt to directly remove their citizens from countries after they allegedly broke criminal laws. "It's a fairly profound breach of state sovereignity for a foreign country to interfere with the judicial system," Currie said. He said it's very difficult to obtain false travel documents, and the law teacher said he agrees with Cohen that the likeliest scenario is that the Saudi embassy provided travel documents. Airlines face heavy fines if they allow passengers to board for international flights without passports or embassy-issued travel documents. Al-Saba, who was in Halifax to learn English, was arrested and charged on June 23, 2006, around the time the alleged assaults took place. He was released on $10,000 bail, but was forbidden from leaving Nova Scotia and -- like Alzoabi -- had to hand over his passport to police. As with Alzoabi, Saudi embassy officials in Ottawa refused to comment. The latest incident comes amidst continuing tensions between Saudi Arabia and Canada. With files from Joan Bryden in Sherbrooke, Que.